Top of the morning to you! 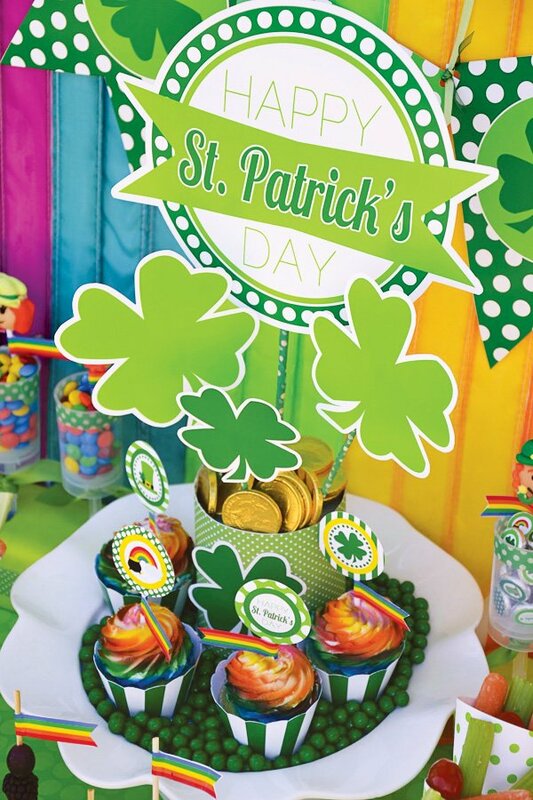 St. Patrick’s Day is right around the corner and Rachel Scott of RV Parties has got the cutest St. Patrick’s Day Brunch ideas to celebrate! 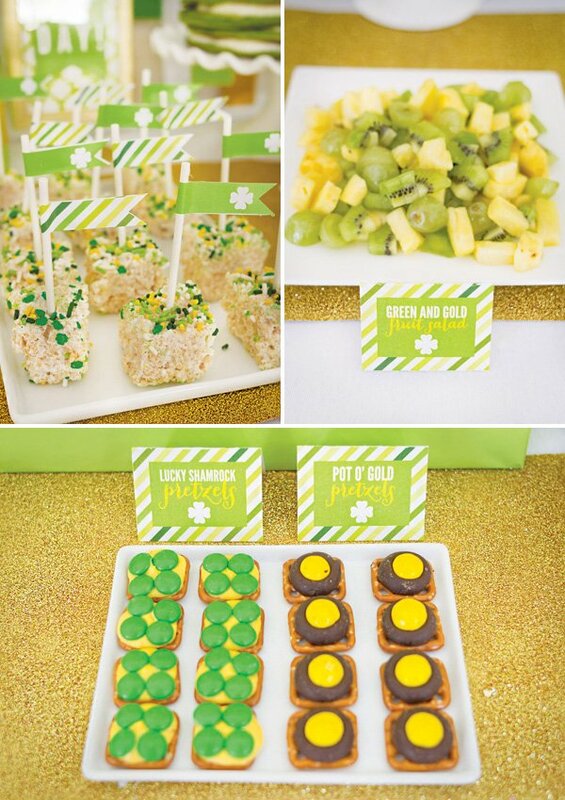 A delicious breakfast filled with adorable green and gold treats sounds like a fun way for any loved one to start the day… and Rachel is also very generously giving away her festive printables to all of you! You might even say it’s your LUCKY day. ;) Thanks, Rachel! 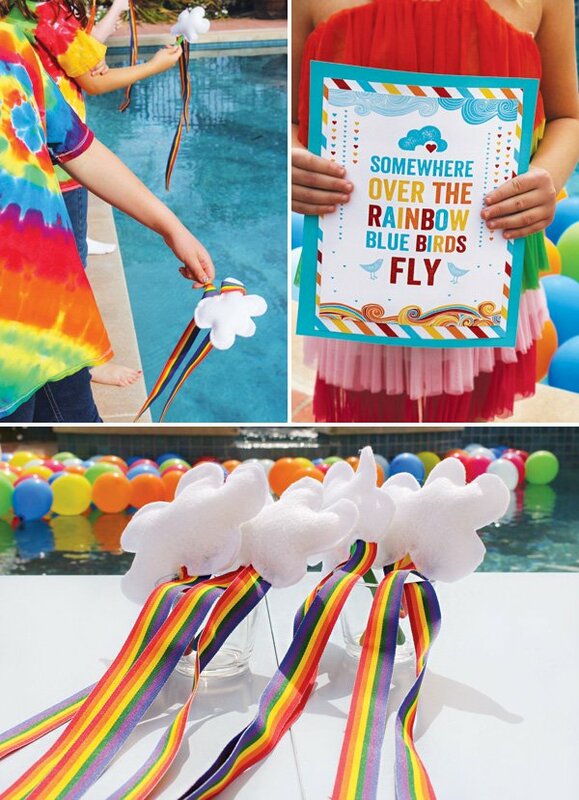 Scroll down to check out all the clever details and to grab the FREE Printables below. 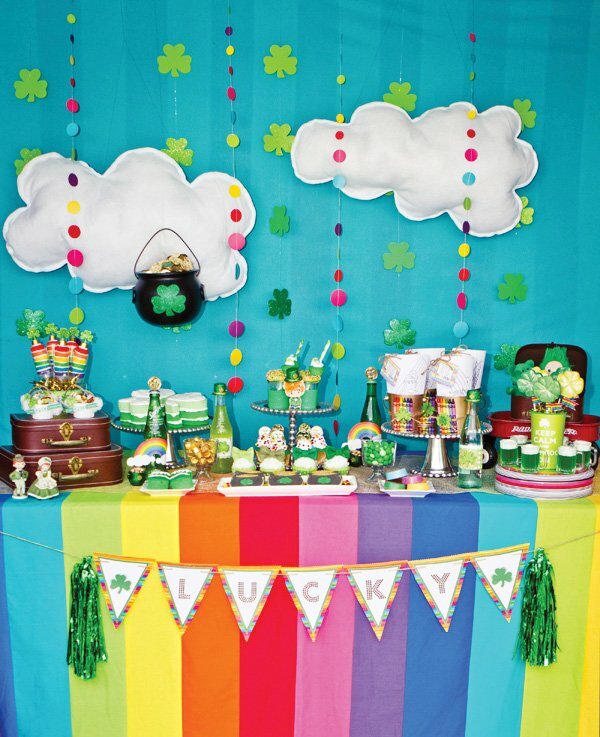 This St. Patrick’s Day brunch was so fun to put together and serve. 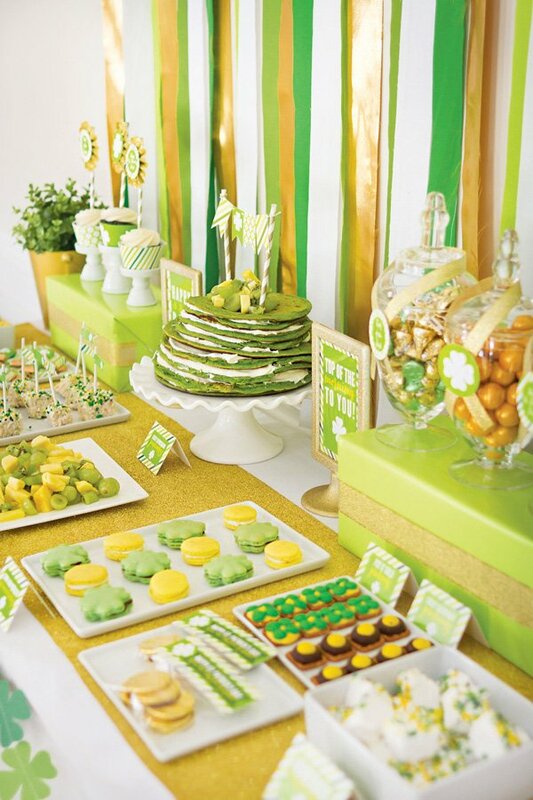 Green and gold were the natural colors to build the party around. 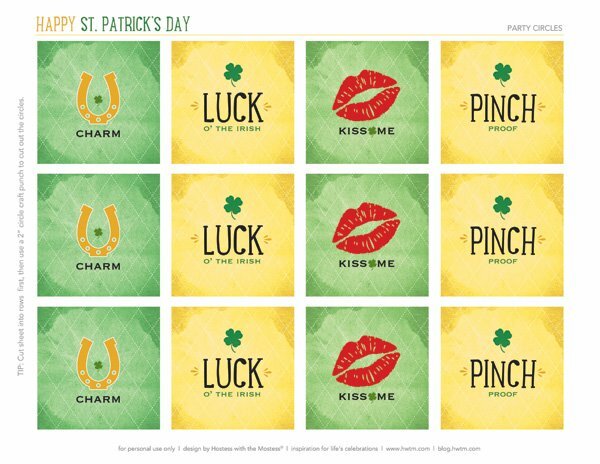 I used a bunch of shades of green when designing the printables so that I’d have a lot of flexibility when picking out decor and food to match them. And of course — GOLD. 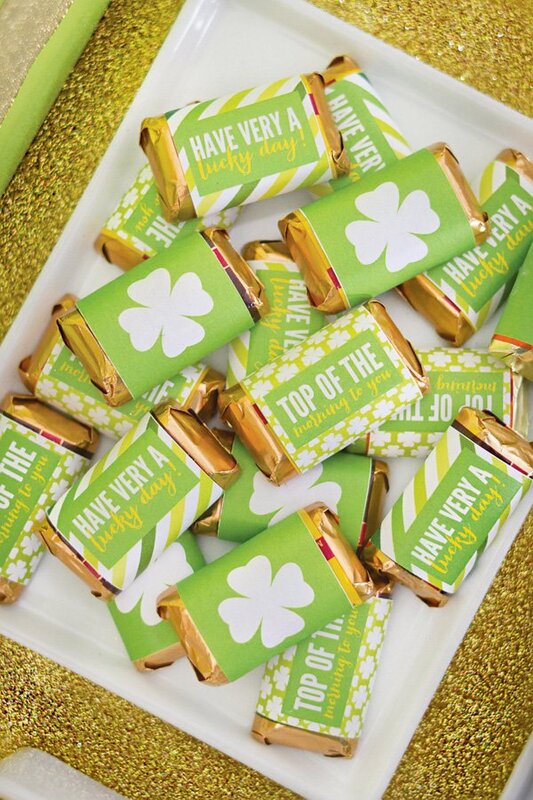 You can’t have a St. Patrick’s Day party without gold! While I’m not sure exactly what “top of the morning” means, it made for a fun theme to plan foods around. My goal was to keep the foods as dye-free as possible — I wasn’t too keen on dumping a bottle of green food coloring into the pancakes. 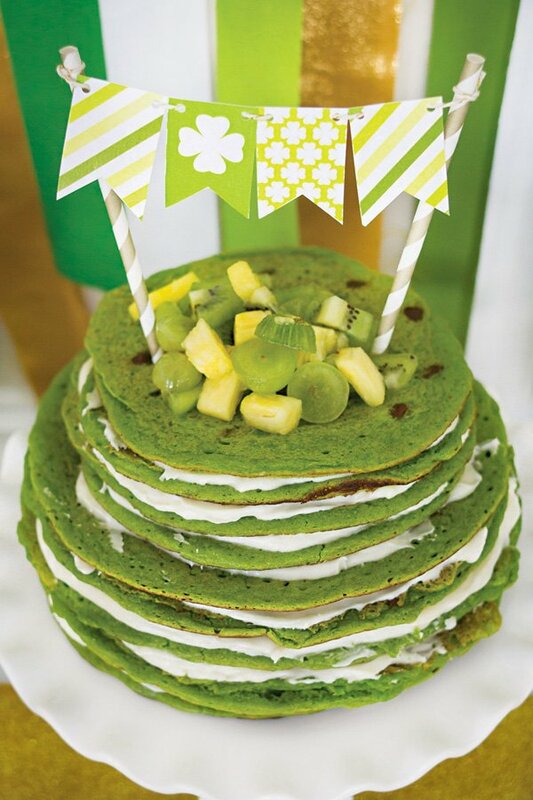 Spinach was an easy way to color the pancakes naturally and sneak some veggies into the kids at the same time. 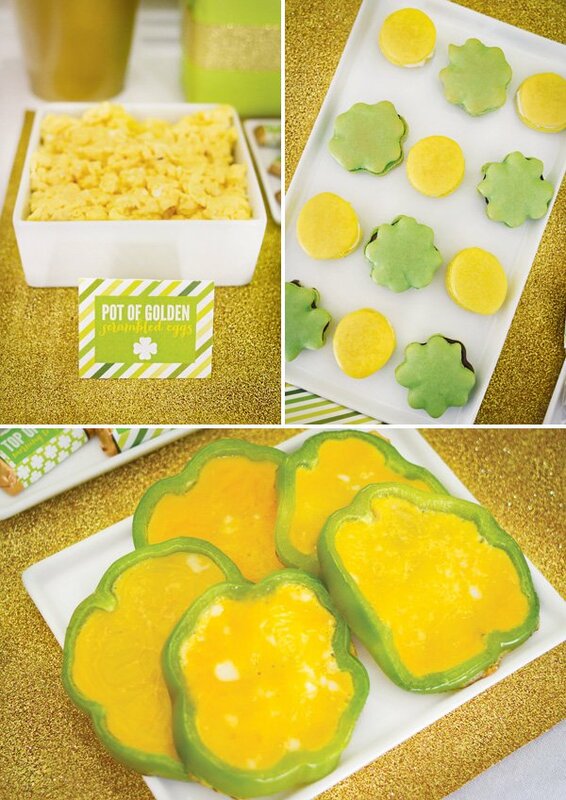 The green bell pepper shamrocks and golden scrambled eggs were a bright and delicious addition to the menu. The fruit salad was a big hit — we used kiwi, green grapes and pineapple. Instead of dyeing the rice krispie treats and homemade marshmallows, I opted for bright sprinkles (in my mind, that made them slightly less dyed!) 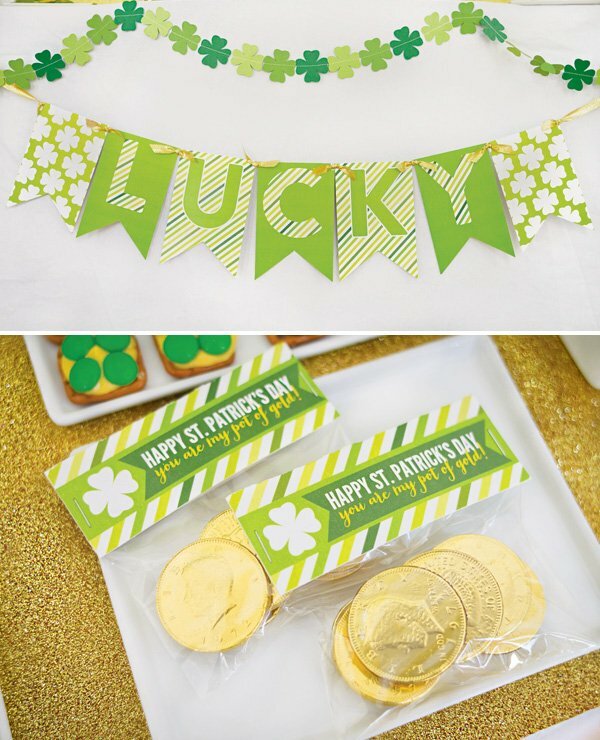 I was a bit smitten with the pretzels — the chocolate pots of gold and shamrocks were too cute. My pride and joy were the macarons — lots of practice went into making the darling little shamrocks and sweet lemon circles. 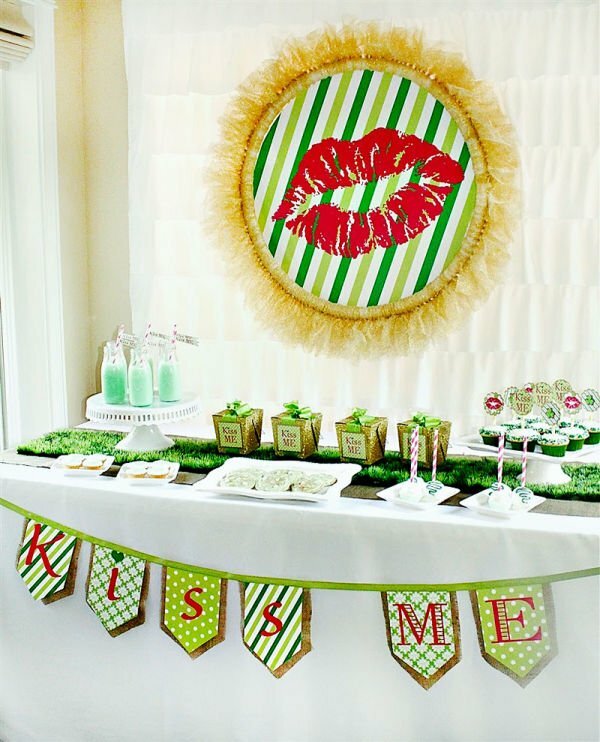 This is such a fun and quick party to put together! The backdrop cost less than $10 to make and really brightened the space. The food can be as easy or complicated as you want. 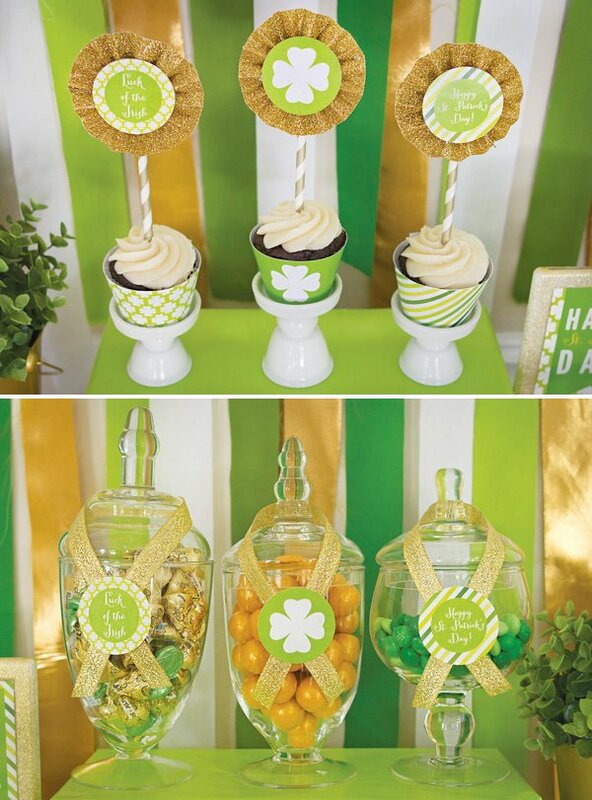 Store bought rice krispies and marshmallows are just as fun as homemade ones and the seasonal Easter candy has lots of green and gold options this time of year. 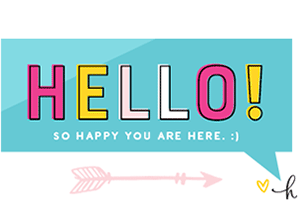 If you’d like to download the FREE printables, click here! Stunning!! 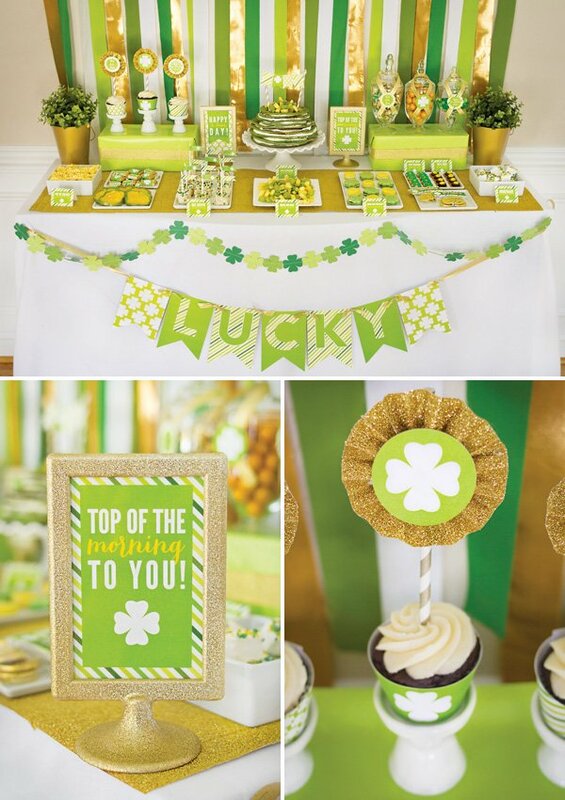 Beautiful styling – love the glittery gold and the lighter shades of green used. Such a cute set up. I love it!